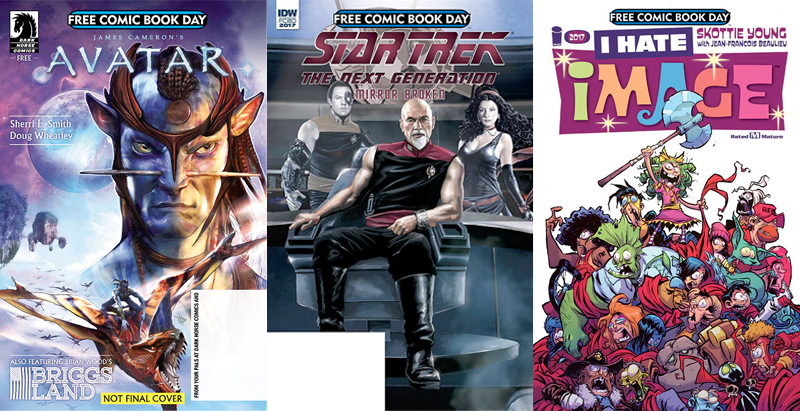 Free Comic Book Day is already a good deal—after all, there is no better deal than “free comics.” But it’s an even better deal when the comics made available for the annual event sound absolutely incredible, and 2017's output is shaping up to be very interesting. Three words, you guys: Mirror. Universe. Picard. The “Gold Sponsor” publishers for next year’s Free Comic Book Day—taking place on May 6, 2017—have announced the special issues they’ll be releasing for the event, and there’s definitely some intriguing titles in there. There’s the ever-wonderful Boom Summer Blast (a regular for FCBD that was thrown into doubt earlier this year by claims the event wanted to cut down on anthology offerings). Dark Horse is lifting the lid on the Avatar ongoing series it announced at NYCC this year. Skottie Young’s I Hate Fairyland star Gertrude is making her way to the rest of the Image universe. And then yes, IDW is totally doing a Next Generation mirror universe story. EVIL FACIAL HAIR FOR ALL. DC and Marvel also “revealed” issues, by which I mean they released black covers displaying logos and not much else. At least we know that Marvel’s will be related in some form to Spider-Man (and something else secretive), but neither company is quite ready to lift the lid on their respective offerings. That might be a good thing—last year’s Marvel offerings teased Civil War II and the ongoing Clone Conspiracy Spidey event, among other things—but given that DC’s top secret offering last year turned out to be a rerelease of a not-great issue of Suicide Squad, it could be a bit of a bust. We’ll have to wait and see. In the meantime, here’s a complete list of all the titles revealed so far—there’ll be more from “silver sponsor” publishers later this month, before they’re all collated in the December 28th issue of Previews Magazine. BOOM! Studios Summer Blast is jam-packed with three stories of mice, monsters, and one supernatural punk band. In an original Archaia short story of David Petersen’s Mouse Guard, a pair of youngfurs learn a lesson from a grizzled guardmouse on what it means to be a hunter. Next, get a sneak peek of the upcoming KaBOOM! series Brave Chef Brianna. To prove herself as a great chef, Brianna starts her own restaurant… but the only town she can afford to set up shop in is Monster City! Finally, the Lumberjanes introduce your new favorite BOOM! Box series Coady and the Creepies. Coady and her sisters are members of a band heading for the gig of their lives… so long as no one realizes that Coady is actually a ghost! Return to the wilds of Pandora and the world of the Nav’i from James Cameron’s groundbreaking film Avatar as Jake Sully connects with the flying Toruk, the majestic Great Leonopteryx, by remembering the depth of his bond with his twin brother and great partnerships of history and legend. Also included in this issue: Set in a secessionist community in rural America, Grace Briggs is trying to guide her family peacefully through trying times. But when confronted with armed milita running an opioid ring on her land, she must take commanding steps. Briggs Land is currently in development for television at AMC. Gertrude has been stuck in Fairyland for decades when she finally hears of a secret passage that may be her way back home. But reaching it is easier said than done as she crosses the border into IMAGE where she’ll have to chop her way through you favorite characters from Saga, The Walking Dead, Savage Dragon, Spawn, Descender, Black Science, Southern Bastards, and any other character I can add to make sure the original art for this issue sends my children to college! Dan Harmon & Justin Roiland’s hilarious hit Adult Swim animated show Rick and Morty has its own critically-acclaimed comic book series from Oni Press! Join degenerate superscientist Rick Sanchez as he embarks on all-new insane adventures with his awkward grandson Morty, his teenage granddaughter Summer, his veterinary surgeon daughter Beth, and his hapless son-in-law Jerry. Catch up on their escapades with this special Free Comic Book Day issue, which includes the story that started it all: Part One of “The Wubba Lubba Dub Dub of Wall Street.” Plus, an exclusive first look at the upcoming miniseries Pocket Like You Stole It! Take a spin through the past, present, and future of Doctor Who universe, in the company of the twelfth Doctor and his brand-new companion, Bill! Featuring Bill’s first Titan Comics appearance, this all-new story is an unmissable experience for fans new and old, with plenty of tantalising teases from Doctors past and present, including incredible clues to the year ahead for all of Titan’s Doctor Who series! Keep your Sonic Screwdriver at the ready and unlock a world of adrenaline-fuelled time traveling adventure! Once upon a time, wizards tried to conquer the Sacred Realm of Hyrule. The Spirits of Light sealed the wizards’ power within the Shadow Crystal and banished them to the Twilight Realm beyond the Mirror of Twilight. Now, an evil menace is trying to find Midna, Princess of the Twilight Realm, and the fragments of the Shadow Crystal to gain the power to rule over both the Twilight Realm and the World of Light. This FCBD special features excerpts from the manga adaptations of The Legend of Zelda: Twilight Princess and The Legend of Zelda: Ocarina of Time.